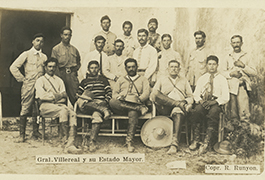 The Elmer and Diane Powell Collection on Mexico and the Mexican Revolution, held by the DeGolyer Library, consists of many unique materials with a focus on the Revolution period and key political and military men. A lifelong student of Texas history, in the early 1970s, Elmer Powell began collecting Republic of Texas bank notes and Civil War county notes. Later, when he acquired some Mexican Revolution-era currency, it also piqued his interest. 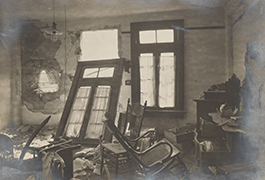 As he re-evaluated the significance of Mexican history as it related to Texas, Powell shifted his focus to the study of money from across the Rio Grande and later extended his interest to the whole Mexican Revolution period, 1910-1920, photography and documents as well as earlier Mexican War materials. Over the years, Powell’s collecting has expanded beyond printed currency to include books, maps, periodicals, manuscripts, photographs, artwork, posters, newspapers, coins, medals, sheet music and memorabilia. 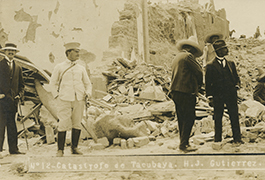 Several rare documents include the signatures of Presidents Díaz, Madero, Carranza, and Obregón and such revolutionaries as Francisco “Poncho” Villa and Emiliano Zapata. The Powell Collection is particularly strong in photography. 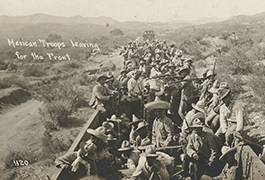 With the fighting in Mexico, many individuals became photographers with a simple box camera, selling photographs printed on postcard stock illustrating the violence during the Revolution, locations and scenery. 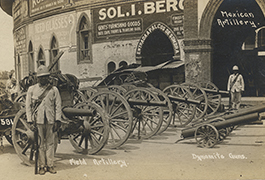 The collection includes over 2,000 real photographic postcards and other photography. Some of the highlights of the collection are photo postcards of the Revolution and important photographs of the Ten Tragic Days in 1913 not found elsewhere. 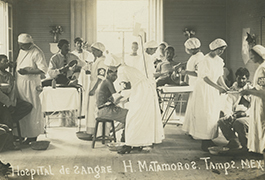 There are images by noted photographers such as Walter H. Horne, Manuel Ramos, Robert Runyon, H. J. Gutierrez, and Cruz Sanchez, and those whose names and pictures are not well-known but are of historical importance. Also of note are 22 original drawings by cartoonist and political satirist, Oscar Cesare (1885-1948). Also of note are 95 stereographs by the Kilburn Brothers, 1873, including views of parks, markets, and cities, a railroad through the mountainside, and prominent cathedrals in Mexico City and the surrounding states. Elmer Powell has amassed one of the major collections devoted to the Mexican Revolution. He continues to be fascinated with the complexities of the Revolution and adds to the collection as he finds new materials. 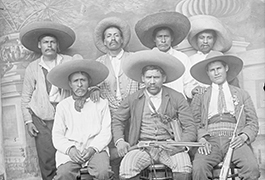 The Elmer and Diane Powell Collection on Mexico and the Mexican Revolution is an important resource for study, scholarly research, exhibitions and a variety of publications.